Phone orders: Call 410-254-8670 and leave a message. We will return your call ASAP. Mail orders: Send check, money order or Credit Card info. Include your return address and phone number. Review: Bill Wagner, Staff Reviewer for Bluegrass Unlimited Magazine. The Sceldom Scene. The Newgrass Revival. The Grateful Dead. Old and In The Way. Anyone who has listened to or has played bluegrass music in the last thirty-five years has felt the impact of those four bands. You may or may not like that fact, depending on which side of the traditional vs. progress argument you favor, but you may have to acknowledge the reality. To acknowledge it is to recognize that when you hear a jam-grass band stretching out or accenting a tune with an old rhythmic punctuation, you’re hearing the legacy of the Dead And The Revival. Or that when you hear internal moving chords and harmonic colorings on the latest Alison Krauss CD or hear traditional tunes tempered with folk and urban stylings, you’re hearing the influence of the Scene. Or that when you hear such standards as “Wait A Minute.” “Friend Of The Devil,” “Midnight Moonlight” or “This Heart Of Mine,” among many dozen others, performed in countless bars and festival jams, you’re hearing the impact of all four. 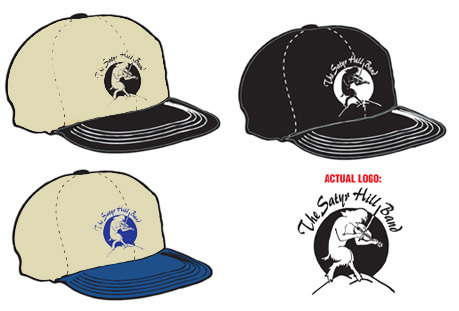 That is the offering of The Satyr Hill Band is not surprising. I’ve been enjoying the creativity and showmanship of Hawk, Chaz, Tom, Rick and Keith for years now, since the first time I heard the current lineup, and can say that few groups have taken these four bands and their era to heart any more so than they. Any show of theirs will feature any number (and potentially all) of the songs presented here. Any mention of the four to them will return a response bordering on the reverential. In other words, the impact has been thorough. So now we’re thinking, “Uh, oh, one of those revivalists, recreationist bands,” like those Beatle tribute shows that feature mop tops and collarless jackets. Not even close. This tribute is not about note-for-note solos or arrangements. Bands such as the Dead, Scene, O&IW and Revival weren’t about copying. 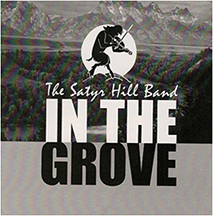 They were abut freeing the music from old confines and about taking what was good in the old and trying it in a new way, filtering their own experience and ideas It is that ethos, above all else, that The Satyr Hill Band captures so well here. 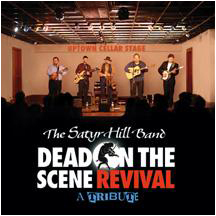 Yeah, you’ll hear the occasional borrowed lick, a reference to a vocal line, a fragment of the original arrangement, all as points of orientation and worship, but you’ll also hear these tunes given fresh and entertaining treatments, twists distinctly those of Satyr Hill. I think The Dead, The Scene, The Revival and O&IW would be pleased. Music taken from various musical genres gives a pleasing, balanced performance showing this group's dedication to a "tight" musical presentation. Click on underlined songs to hear sample. Our tee shirts are made by Fruit of the Loom&REG; with 100% heavy cotton material preshrunk for comfortable fit and durability. Sizes range from Small to XXXL. A) Standard. Small logo in upper left corner of front and large logo centered on the back. Colors: All logos and print are white on the following backgrounds: Black, Maroon, Deep Forest Green, Royal Blue, Red, Gold, Steel Blue, Olive Drab, Gunmetal Gray, Teal, Yellow, Mint Green, Ivory, Purple, Navy Blue, Rose, Athletic Gray (light or medium). B) Special Edition. Our special edition features a large logo on the front and a BANdTHOLOGY on the back. Colors: White on black only. C) Special edition with The Satyr Hill Band Logo within a radiating sunflower pattern tie dye on a green tie dye background. 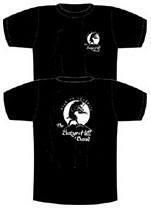 D) Special edition with The Satyr Hill Band Logo on the front and a sapphire tie dye running across the shoulders.